An island of reason within a sea of nonsense. “Out of concern for Germany” read the headline of Blätter, the Journal for German and International Politics (Blätter für deutsche und internationale Politik), that was first published on 25th November 1956. Today it might be: “Out of concern for democracy” – in Europe and beyond. All across Europe the rise of right-wing populism is evident. The post-war development of the Western European model of democracy consisting of key principles such as political parties, free market economy, representative government, and civic participation seems to have failed. How can we save democracy? This is just one of the big questions the “Blätter” intends to look at in the future. Blätter is the most widely read political journal in the German-speaking area. The journal self-publishes a monthly issue which is independent from companies, churches, interest groups and political parties. In times of increasing ownership of the media, it provides lively and critical media coverage. It considers itself a forum for current political discussion. 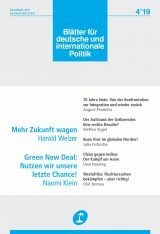 Within the 128 pages, Blätter authors comment on and analyse the political events in Germany and abroad – retaining a critical perspective on the technocratic and neoliberal mainstream. The nearly 10.000 subscribers guarantee its editorial and financial independence. The total print run is 11.000 copies. Blätter aims to bring together academia and political intervention. On the one hand, it is focused on contributions with arguments backed up by academic standard citations, on the other hand, every text is held to journalistic standards of good readability and comprehensibility. The editorial office consists of the five editors Anne Britt Arps, Daniel Leisegang, Albrecht von Lucke, Annett Mängel and Steffen Vogel. They are supported by a circle of publishers that share Blätter’s belief in editorial standards and emancipatory analysis of political debates. Among the 22 publishers are Jürgen Habermas, Seyla Benhabib, Norman Birnbaum, Saskia Sassen, Katajun Amirpur, Peter Bofinger, Micha Brumlik, Rudolf Hickel, Claus Leggewie, Jens Reich, Friedrich Schorlemmer and Hans-Jürgen Urban. This stable publishing circle guarantees that Blätter remains what it has been for 60 years: »an island of reason within a sea of nonsense« (Karl Barth). Blätter editors also organise the popular annual Democracy Lecture. The event intends to provide a platform for exceptional and critical interventions in current debates on economic, political and social issues, and is one of the largest of its kind in Germany. Previous lectures were given by Thomas Piketty, Naomi Klein, Paul Mason and Wendy Brown. Die »Blätter« verstehen sich als Forum für aktuelle politische Diskussionen. Monat für Monat kommentieren und analysieren die »Blätter«-Autorinnen und Autoren auf 128 Seiten das politische Geschehen in Deutschland und der Welt – jenseits technokratischer Sachzwänge und neoliberaler Alternativlosigkeit. Die redaktionelle und wirtschaftliche Eigenständigkeit der »Blätter« sichern die knapp 10.000 Abonnentinnen und Abonnenten, die Druckauflage liegt insgesamt bei 11.000 Exemplaren. Der fünfköpfigen Berliner Redaktion gehören Anne Britt Arps, Daniel Leisegang, Albrecht von Lucke, Annett Mängel und Steffen Vogel an. Sie werden von einem Herausgeberkreis unterstützt, der den redaktionellen Anspruch einer emanzipatorischen Analyse politischer Debatten teilt. Zu den 22 Herausgeberinnen und Herausgebern zählen unter anderem Jürgen Habermas, Seyla Benhabib, Norman Birnbaum, Saskia Sassen, Katajun Amirpur, Peter Bofinger, Micha Brumlik, Rudolf Hickel, Claus Leggewie, Jens Reich, Friedrich Schorlemmer und Hans-Jürgen Urban. In seiner personellen Kontinuität stellt der Herausgeberkreis sicher, dass die »Blätter« auch in Zukunft bleiben, was sie seit 60 Jahren sind: »eine Insel der Vernunft in einem Meer von Unsinn« (Karl Barth).